Here’s another dish inspired by one of our favorite restaurants. There’s a nice, little Cuban restaurant not too far down the road called La Fonda Latina. Usually, I get the bocadillo latino, but lately I’ve been getting their ensalada pescado. My wife ordered it first and then made the mistake of asking us to taste it. By the time we got through with it, she had very little dinner left for herself! So the other day I saw a nice looking salmon fillet in the store and thought I’d try my own version. 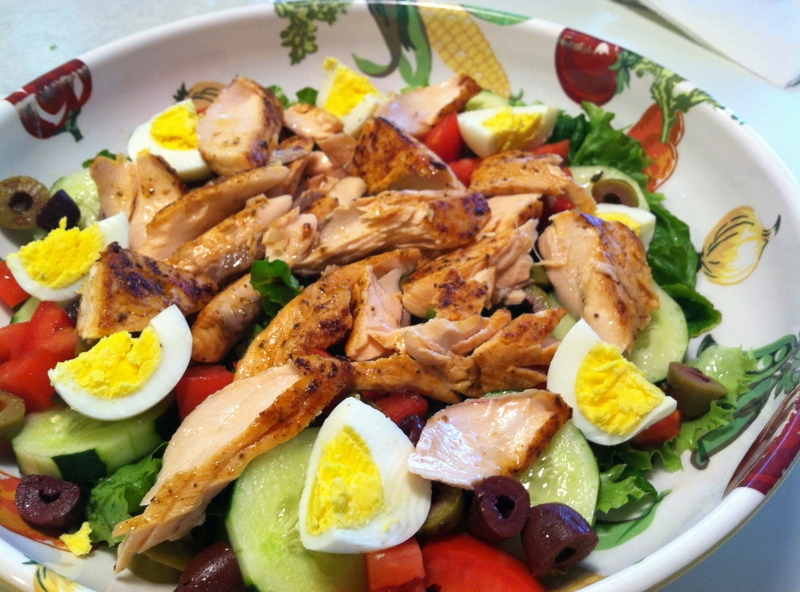 Really, it’s quite different–no corn, no onion, and I’ve added olives and hard boiled eggs. I must have done something right, though, because everyone devoured it! If you purchased your salmon as a single, large fillet, section it into two smaller fillets to make it easier to manage the fish. Squeeze the juice of one lime over the salmon. Season with salt, to taste, and approximately 1 teaspoon of Old Bay. Set aside, and begin preparing your salad ingredients. Tear the lettuce leaves into bite-size pieces, removing most of the core. Layer on top of the lettuce chopped tomatoes, cucumber slices, green olives and kalamata olives (sliced in halves or thirds, depending on the size), and quartered hard boiled eggs. Set aside, and return to your fish. Heat a non-stick pan over a medium flame, adding around an ounce of olive oil. When your oil is hot, add your seasoned salmon fillets to the pan, flesh side down. Leave the fish until it has cooked almost through, moving it as little as possible to ensure a good sear. Turn the fillets skin-side down and cook for another couple of minutes, until the skin starts to crisp. Transfer the fish into a separate plate and let cool for a few moments. While the fish sets, dress your salad. I go pretty simple: no cruet, just salt, pepper, garlic powder, red wine vinegar, balsamic vinegar, and olive oil directly onto the salad. Before you toss the salad, add in the salmon, removing it from the skin and leaving in relatively large flakes. Toss the salad gently, trying not to break up the salmon too much, and serve. This entry was posted in Uncategorized and tagged light, salads, seafood. Bookmark the permalink.